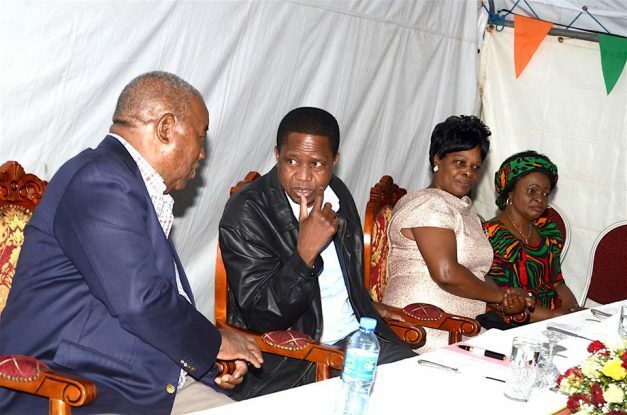 File: President Lungu talking to former president Rupiah Banda while his wife Esther looks on. Opposition NDC shadow leader Chishimba Kambwili has urged President Lungu to urgently resolve his matrimonial differences with the first lady Esther. Kambwili who is the governing party, PF Roan Member of Parliament though he has been expelled said it is sad that the Head of State has social problems with his wife. The Outspoken Lawmaker said this in a press release below issued by the NDC Media team in Luanshya. And Kambwili has described President Lungu’s address to Parliament as a mockery. Lungu is corrupt – Kambwili! National Democratic Congress NDC consultant Chishimba Kambwili says the Presidential address to Parliament yesterday was a mockery. Dr. Kambwili said President Edgar Lungu insulted the integrity of the people of Zambia by discussing corruption and morality. Dr. Kambwili said president Lungu has no moral right to discuss corruption because he is not clean. Dr. Kambwili has accused Mr. Lungu of running an extremely immoral régime. He has added that Mr. Lungu is surrounded by corrupt elements at statehouse. The NDC consultant has wondered how Mr. Lungu has managed to accumulate so much wealth within his short stay in power. Dr. Kambwili said Mr. Lungu can not account for the illicit wealth he has acquired. He added that Mr. Lungu will soon lose the grip to power just like former South African leader Jacob Zuma. He added that fate us waiting Mr. Lungu once he loses power in 2021. The NDC consultant was speaking at a press briefing in Luanshya today. He noted that Mr. Lungu and his cronies have syphoned a lot of money through Neiria investments and Avic international among other Institutions. Dr. Kambwili said the NDC will ensure that corrupt leaders are persecuted after the pf leaves office. He said state house and the Ministry of Health, Defence, Energy and infrastructure development were among the most corrupt institutions in the country. He observed that Mr. Lungu is using the Ministry of Health to steal money meant for the purchase of drugs. He observed that he has information that Mr. Lungu has purchased equipment from a foreign country for the military at exhibititant costs. And Dr. Kambwili has urged President Lungu to urgently resolve his matrimonial difference’s with the first lady Esther. Dr. Kambwili said it’s sad that the president has social problems with his wife. Issued by: NDC Media Team. Kambwili alesabaila. Last days for him as he can not check himself on all matters he says. Empty tin true. “An empty tin always makes noise” so goes the saying. Remove the log in your eye first before you call others corrupt. Can Mr Kambwili account for his wealth first with documentary evidence of contracts, profits made etc. If this story is true then I am very concerned about the state of mind of Mr. Kambwili. Examin your mind first,that’s what the Bible says. These accusations are serious issues that has the potential to destroy someone. Therefore, it is important to avoid street rumours to accuse someone. I will be very pleased to see action based on facts. Talking of this, just how many alleged corruption cases has ACC successfully prosecuted since it was established? I personally do not recall. Even Mwanawasa (MHSRIP) circumvented ACC and created the Taskforce to prosecute Chiluba (MHSRINP). they also did not succeed. It is largely for the same reason that even prosecuting agencies use street rumours to prosecute, and end up miserable failures. In fact cases of corruption are extremely difficult to prove because the corrupted would be foolish to leave evidence. This then calls for special training for people dealing with corruption. Try Scotland Yard. Investigators should get smarter than the corrupted. Otherwise forget it. This brings me to another related issue. We have a law which compels office bearers to declare assets and liabilities upon ascendancy to the office. But what they declare is not verified by any independent verifier. At the end of their term, they are not even compelled to declare. So how can anyone reasonably argue about acquisition of assets in a given period of time without any benchmarking? I thought that the purpose of such a declaration was to provide checks on individuals’ acquisition of assents before becoming office bearers and to determine their worth upon leaving office. This way, one should be held accountable for acquisition of assets beyond cumulative earnings during the tenure of office. Finally, we may even be better off using the law on acquisition of assets suspected to be proceeds of crime to succeed in prosecuting cases. Or the law on abuse of authority of office to acquire personal wealth. These accusations are serious issues that have the potential to destroy someone. Therefore, it is important to avoid street rumours to accuse someone. I will be very pleased to see action based on facts. This brings me to another related issue. We have a law which compels office bearers to declare assets and liabilities upon ascendancy to the office. But what they declare is not verified by any independent verifier. At the end of their term, they are not even compelled to declare. So how can anyone reasonably argue about acquisition of assets in a given period of time without any benchmarking? I thought that the purpose of such a declaration was to provide checks on individuals’ acquisition of assets before becoming office bearers and to determine their worth upon leaving office. This way, one should be held accountable for acquisition of assets beyond cumulative earnings during the tenure of office. This is now paging ponox! dont enter another mans bedroom.